Last week's close approach of Asteroid 2007 TU24 had many people concerned. This was all for naught, however, as astronomers knew that it would not impact the Earth. Still, the internet was chock full of sensationalized videos of people being genuinely scared of this asteroid. On the other end of the spectrum (the logical end, I might add) was Phil Plait, of Bad Astronomy. His video settled it once and for all. So its obvious that Asteroid 2007 TU24 posed no danger to us. But what if it had? Now that the asteroid has passed, we can look back and think: "What did we learn?" So what exactly did we learn? We should take this opportunity to think about the possible scenarios. The first scenario, which is what actually happened, is that the asteroid completely missed us by a long shot. This is easy to deal with; just enjoy the show it puts on as it zips by. But what if the asteroid had been on a collision course with Earth? What would we have done? If Asteroid 2007 TU24 had been on a collision course, there would most likely not have been anything we could do. With size estimates ranging from 150 meters to 600 meters, the asteroid would most likely have impacted the surface. Although it pales greatly in comparison to the "dinosaur-killer", which was about 10 to 20 kilometers across, this asteroid could have done some real damage. This damage would most likely have been confined to one area, most likely a body of water. But if this one area were a city, it wouldn't be quite so insignificant any more. "If we have only 5 years' notice, we can say good-bye to one another... If we have 10 years or so, our chances are still slim..."
This rather grim view of the situation may or may not be accurate, but the fact remains that the required "preparation time" is far longer than 15 weeks. So we must start searching more fervently, and attempt to catalog a larger percentage of the "big" near-Earth objects. Asteroid 2007 TU24 wasn't "big" by any means, but there are plenty of big ones out there. Currently, near-Earth object, or NEO, hunters are detecting a staggering amount of NEO's. In the above chart, you can see the total number of NEO's discovered by each of the major five sky surveys. As you can see, the Catalina Sky Survey is currently leading in NEO discovery, and Catalina was the program that discovered 2007 TU24. 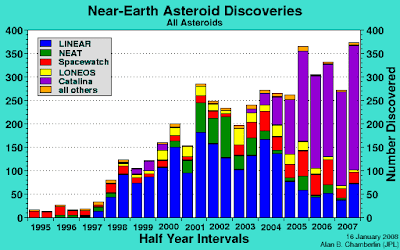 In addition to improved and continued funding of prediction of asteroids, we also need more funding of protection from asteroids. Space-based defenses will be our front-line defense from large asteroids, if world governments start funding such things. There are all kinds of ideas floating around, but not so many solutions. Ideas can't stop asteroids. For once in a species' lifespan, we have to ability to avoid our own extinction, to avoid the fate of the dinosaurs. 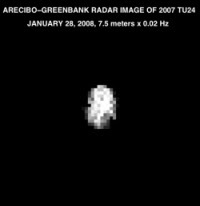 Shouldn't Asteroid 2007 TU24 have been the wake-up call? 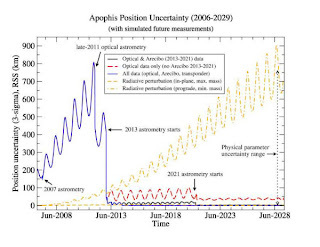 UPDATE: Upon further investigation, I've found this page, which details NASA's NEO Program's efforts to nail down orbital data on Apophis, a very large asteroid to make a really close approach in 2029 and 2036. Below, you can see that they actually have a plan laid out to get the orbital data figured in time for a possible intercept. This is the kind of planning I can appreciate. Images courtesy of NASA/JPL-Caltech, Arecibo/Greenbank/NASA/JPL-Caltech, and NASA/JPL NEO Program, respectively. Whilst the effect of tu24 appears to be negligible, the discussion of near asteroid impact has increased the level of concern that I feel. 1. Nasa seems to have trouble detecting asteroids. WD5? was detected 2 weeks? after it passed earth. Furthermore, it would appear that up to 5 asteroids have passed by earth in the last 2 months. Does Nasa have the capability to detect asteroids that are outside of the solar system, or are they only able to detect asteroids whose orbits are contained more or less in our solar system? 2. Does the density of objects increase, decrease, or remain unchanged with proximity to the galactic plane? This is REALLY important because if the density is going to increase, we had better have a capability for detecting these objects. 3. Our sun oscillates above and below the galactic plane. Most certainly, other objects in our galaxy do likewise in similar fashion. Does anyone understand how the objects of our galaxy move about the galaxy? 4. The recent Nasa comet impact experiment appeared to coincide with a large zap, which occurred just prior to impact. Does this add confirmation to the electric theory of the universe? 5. Apparantly, the atmospheric pressure on Saturn has increased by over 30% in the last 18 years. There appear to be other massive changes occurring to other planets of the solar system, and these changes are not related to solar activity. Are these changes being caused by the galactic plane? Can anyone challenge this, or clarify it, please? The warning time for a hurricane or a volcano is only a few days, and for an earthquake, it is a few seconds. So 15 weeks is heaps of time. There are far more common natural disasters, and by the time a bolide does hit a city, the number of cities wiped out by floods, storms, earthquakes and other terrestrial problems will be far higher. In regards to your concerns, safetyfactorman, I would believe that galactic plane crossover is not going to adversely affect our planet. If crossover is to occur in 2012, then on an astronomical scale, we are already in the middle of our crossover. And you are correct that field intensity varies with the inverse square law, but it won't necessarily be affecting the density of matter. If this were the case, there would be measurable changes in the density of water, for example. I think a lot of what can be read on the internet about galactic plane transit and the such needs to be taken with a grain of salt, i.e., not every theory is necessarily correct. One can also not neglect the fact that we are always feeling the gravitational tug of the galaxy. It might be a worthwhile exercise to calculate how much such a gravitational field might change, if noticeably. In regards to chuck's view on the scale of such a warning time, I agree, 15 weeks is relatively long compared to most other forms of natural disasters. Although if we wanted to get a spacecraft up there and destroy or move such an object, we would need more time. Thanks for the comments! I'm always up for some scientific conversation! Please note the update posted at the bottom of the article. safetyfactorman, I assume that you are referring to the Mayan calender. That calender refers to the precession of the equinox, that makes it appear that the sun is in the galactic plane, not that the solar system is going to be in the galactic plane itself, on 2012. I have not gotten definitive (as definitive as one can get) proof as to where we are on the cycle of crossing the galactic plane yet, I'm still searching. However, the halve cycle from plane to plane is somewhere between 30-40, probably closer to 33-36, million years and it appears that we may have crossed the galactic plane a few million years ago. There is no difference between the 2012 winter solstice and any other, and it has no relation to the solar system actually crossing the galactic plane. You can sleep well at night. Don't believe me, do a little research and prove it to yourself. Spot On With This Write-up, I Actually Suppose This Web Site Needs Way More Consideration. read here I?ll Probably Be Again To Learn Far More, Thanks For That Info.